Working with Hasker Architects and AGC Glass, Euroview supplied exceptionally flat glass for a contemporary facade office extension to a listed building. 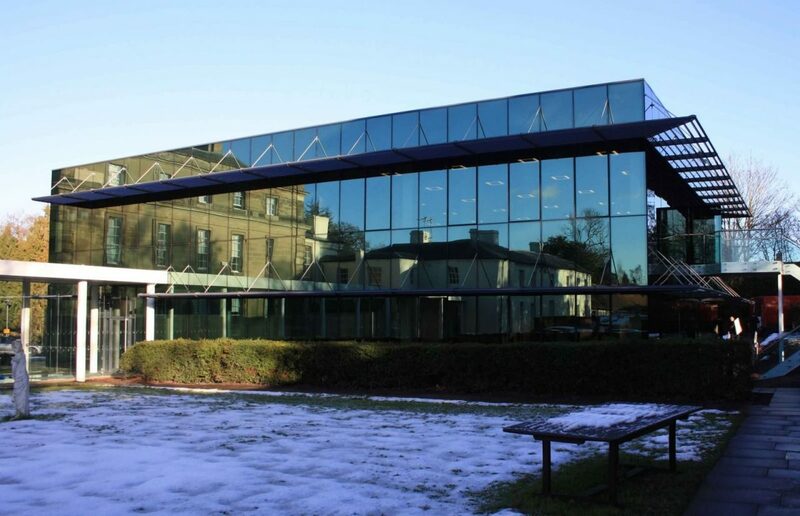 Meriden Hall is a Grade 2* listed status building located between Coventry and Meriden that required a highly reflective green, fully glazed structure to provide additional office accommodation. Working with AGC Glass and Hasker Architects, Euroview was able to help create a facade solution with a striking end result. We were involved throughout the project, from manufacturing samples to the production of the IGUs. We manufactured high-performance IG units using 1,000m2 of 8mm Stopsol Classic Green pos 2 toughened and HST + 12.8 1.0 low-e laminated glass, offering excellent light and energy performances, therefore, ensuring the comfort of those working in the building whilst reducing energy costs. We were able to achieve rollerwave of less than 0.1mm/300mm with our Glaston FC500 tempering furnace with iLook quality system, ensuring a perfect reflection of the adjacent listed building.